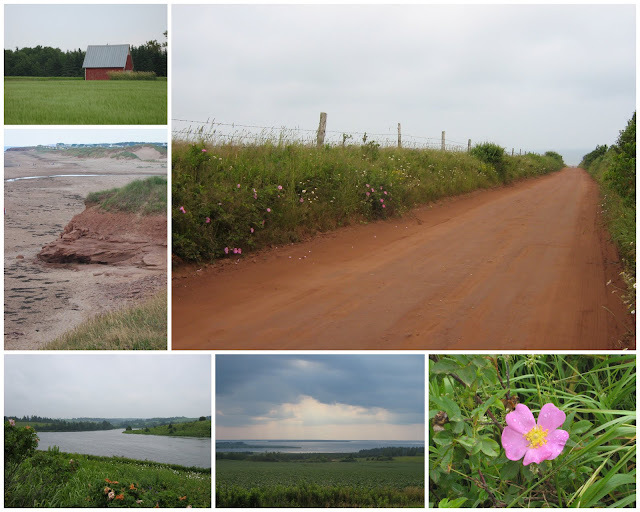 I thought I would share a few snapshots with you that I took while home on PEI. I was home for a pretty quick visit to my lovely island, and spent most of it playing with my too cute nephew, meeting my newest niece for the first time, and visiting with my family. The cooler windy days at home were a refreshing change from the unending heat I came back to today in Ottawa. I revelled in wading with a squealingly happy nephew in the unusually (for July anyway) cold water off the North shore by our cottage, taking in the smell of the salt in the air, chats with my parents on the deck in the evenings, traipsing around the island with my mom and along the way snapping a few photos here and there to send to a lovely italian lady, watching fireflies flutter through the trees, and generally taking in as much island as I could during my short weekend visit. Love. Great, beautiful photos. Looks like such a relaxing place. I can't wait to go costal in T-minus less-than-two-months!! PEI is so so beautiful! I visited once when I was 12 and I absolutely loved it. I would definitely love to return. congratulations on your new niece!